Try this sharp looking set! These generously sized pots can provide quick meals from your microwave. 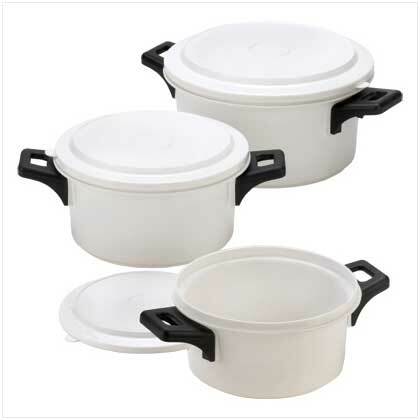 Cook and serve in this attractive Microwave 6-Piece Cooking Pots Set, directly to your dining table. Great choice for your cooler summertime meal preparation. Plastic construction material Is suitable for use in your microwave. Lightweight To allow ease in lifting and handling. Versatility of pans Permits cooking and then refrigerator storage in the same container for any leftovers. Easy cleanup in the dishwasher to save time and effort. Snap-on lids Keep leftovers fresh and prevent drying out.